professionals from all over New Zealand. best bits at a glance. Got a question? Want to help us spread the word? Or even if you just want to say hi, flick us an email and we’ll do our best to help. Welcome to Creative Connect, a free web service, and design-centric network site that fosters collaboration, networking, and productivity in the creative professional community. Our website www.creativeconnect.co.nz (the “Site”) is operated and provided by CreativeConnect Ltd ("We," "Us," or "Creative Connect"). Whilst we believe you will do the right thing at all times, our lawyers, and hence we, require you to accept these terms and condition. The content and services offered at the Site and any associated sites from time to time, and any communications service (including the capability to contribute links and other information), or other interactive service that may be available to you on or through this site, are provided to you under the terms and conditions of these Terms and Conditions which includes any operating rules or policies that may be published by us at the Site from time to time. The Terms and Conditions and all such operating rules or policies comprise the entire agreement between you and us and supersede all prior agreements between you and us regarding the subject matter contained herein. IMPORTANT: BY COMPLETING THE REGISTRATION PROCESS, OR USING Creative Connect, YOU AGREE TO BE BOUND BY ALL OF THE TERMS AND CONDITIONS HEREIN. You must be thirteen or older to register as a member of Creative Connect. Use of the Service is void where prohibited. By using this Site, you represent and warrant that you have the right, authority, and capacity to enter into this Agreement and to abide by all the Terms and Conditions of this Agreement. Creative Connect may change the Terms and Conditions from time to time and at any time, and without actual notice to you. All such changes to these Terms and Conditions will appear on the Site. By using this Site after we post any changes, you agree to those changes. If at any time you choose not to accept these Terms and Conditions, please do not use this site. We are the sole owner of the information collected on this site. We will not sell, share, or rent this information to others in ways different from what is disclosed in this statement. We collect information from the Sites visitors at several different points on our website. USER-GENERATED CONTENT. Uploaded or entered multimedia content developed and owned by creative professionals across industries. Creative Connect-CONTENT STORAGE. Creative Connect does not store your up-loaded original files e.g. Image, Video and Audio assets. All media is converted and optimized for your profile then deleted. JOB LIST. 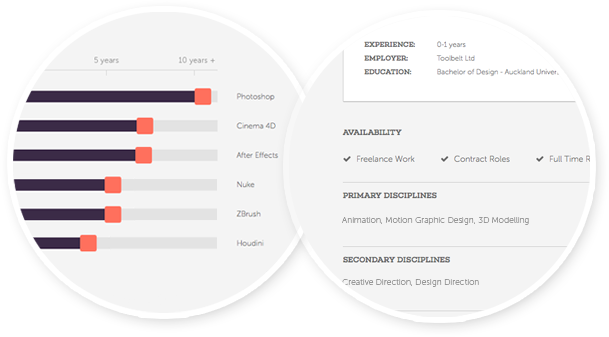 A directory of jobs in the creative professional community. OTHER FEATURES. You may also conduct various other tasks through the service. In order to use any feature of the Service not described above, you may be required to register for a free Creative Connect account. You are solely responsible for any data, text, software, music sound, images, photographs, graphics, video, messages, files or other materials ("Content") which is transmitted, posted, or distributed by you through the Service, including but not limited to the contents of your e-mail communications, information, photos or images posted by you or posted to your Profile Page and information, photos, images, sound files or other Content posted by you in a forum or other page. By posting Content you warrant and represent that you own all right, title and interest to that Content and any likenesses contained in that Content. Creative Connect does not own or control the Content posted by Users via the Service and, does not guarantee the accuracy, integrity or quality of such Content. You may be exposed to Content posted by other Users that may be offensive, indecent or objectionable. Under no circumstances will Creative Connect be liable in any way for any Content posted by any User or third party, including, but not limited to, liability for any errors or omissions in any Content or for any loss or damage of any kind incurred as a result of the use of any Content posted, e-mailed or otherwise transmitted via the Service. b. without limitation of the foregoing, not to use the Site or Services to submit any Contribution regarding any products or multimedia files, or make comments about them, that are unlawful, harmful, threatening, abusive, harassing, defamatory, vulgar, libelous, deceptive, fraudulent, contains explicit or graphic descriptions or accounts of sexual acts, invasive of another's privacy, or hateful; or that victimizes, harasses, degrades, or intimidates an individual or group of individuals on the basis of religion, gender, sexual orientation, race, ethnicity, age, or disability. c. not to harvest, collect or store information about Users or the content posted by others on this Site or use such information for any purpose inconsistent with the purpose of this Site or for the purpose of transmitting or facilitating transmission of unsolicited bulk electronic mail or communications. Illegal and/or unauthorized use of Creative Connect, including aggregating usernames and other contact information for the purpose of sending unsolicited communications is prohibited. Unauthorized framing of the Site is also prohibited. Inappropriate use may result in your being removed from participant listings without notice and may result in termination of your privileges for participation in Creative Connect. Appropriate legal action may also be taken for any unauthorized use of Creative Connect. d. that Creative Connect is not responsible for material submitted to Creative Connect or posted to the Site by Users. Creative Connect does not pre-screen, monitor, review or edit the Content posted by Users. However, Creative Connect and its designees have the right (but not the obligation) at their sole discretion to refuse or remove any Content, in whole or part, that in our judgment does not comply with these Terms and Conditions or is otherwise undesirable, inappropriate or inaccurate. Creative Connect is not responsible for any failure, non-failure or delay in removing such Contribution. You will remain responsible for the accuracy, copyright compliance, legality, decency, or any other aspect of such submitted material, including any Content or part thereof, or other communication to Creative Connect. You agree to immediately notify Creative Connect of any unauthorized use of the Service or any other breach of security that you know or suspect. Creative Connect reserves the right at any time and from time to time to modify or discontinue, temporarily or permanently, the Service (or any part thereof) with or without notice. You agree that Creative Connect shall not be liable to you or to any third party for any modification, suspension or discontinuance of the Service. a. You acknowledge and agree that all information including but not limited to data, text, software, music, sound, photographs, graphics, video, messages, tags, or other materials, including Content contained in sponsor advertisements or information presented to you through the Service or by advertisers may be protected by copyrights, trademarks, service marks, patents or other proprietary rights and laws. b. Thus, all Content is either the copyrighted property of Creative Connect, or the copyrighted content of its Users that created and submitted the content, and its affiliates or licensors. As between Creative Connect and you, Creative Connect is the sole owner of all Creative Connect-generated content on the Site, including without limitation, all applicable copyrights, patents, trademarks, and trade secrets, and other intellectual property rights thereto. Participants in Creative Connect retain all rights, titles, and interests in and to the content provided by the Participant hereunder (including, without limitation, the copyrights in and to the Participant's Content), subject to the non-exclusive rights in the licenses granted to Creative Connect under this agreement. The Participant is free to grant similar rights to others during and after the Term of this Agreement. c. All individual articles, content and other elements comprising this Service are also copyrighted works. In addition to abiding by any rights each author may have retained in connection with each such article, you must also abide by all additional copyright notices or restrictions contained in this Service. d. Unless expressly permitted by Creative Connect or advertisers, you may not copy, reproduce, distribute, publish, enter into a database, display, perform, modify, create derivative works, transmit, rent, lease, sell, or in any way exploit any part of this Service. e. Neither you nor any third party shall make use of the contents of the Service in any manner that constitutes an infringement of our rights, including copyright or trademark that has not been expressly authorized by us. You agree to defend, indemnify and hold Creative Connect, its affiliates, officers, directors, employees, representatives, successors and assigns, harmless from any and all claims, liabilities, costs and expenses, including reasonable legal fees, arising in any way from your use or misuse of the Site or Services, or the uploading, posting, publishing, e-mailing, reproduction, distribution or transmission of any Content or other materials by you or Users authorized by you or any violation of these Terms and Conditions by you (including, but not limited to, any claim that your Content infringes the rights of any third party). You acknowledge and agree that Creative Connect may preserve any Contribution and may also disclose your Contribution if required to do so by law or in the good faith belief that such preservation or disclosure is reasonably necessary: (a) to comply with legal process; (b) to enforce these Terms and Conditions; (c) to respond to claims that any Contribution violates the rights of third-parties; or (d) to protect the rights, property, or personal safety of Creative Connect, its Users or the public. a. You understand that the technical processing and transmission of the Site, including your Contribution, may involve (a) transmissions over various networks; and (b) changes to conform and adapt to technical requirements of connecting networks or devices. Creative Connect assumes no responsibility for the deletion or failure to store Contributions or other information submitted by you or other Users to Creative Connect. b. Any or all Content on the Site may be purged periodically at Creative Connect's sole discretion. You acknowledge and agree that all Content you view, submit or post is at your own discretion and risk, including any reliance on the accuracy, completeness, or usefulness of such Content. You acknowledge that you may not rely on any Content created by Creative Connect or submitted to Creative Connect. You further acknowledge and agree that the views expressed on the Site do not necessarily reflect the views of Creative Connect, and Creative Connect does not support or endorse Content posted or submitted by you or any User. c. In operating this site, Creative Connect does not solicit nor does it wish to receive any confidential, secret or proprietary information or other material from you. Any information or material submitted or sent to Creative Connect, will be deemed not to be confidential or secret. By submitting or sending information or other material to Creative Connect you represent and warrant that the information is original to you and that no other party has any rights to the material, and that the material and information will not violate any of the prohibitions set forth above ("User Conduct"). You may be able to link to third parties' Sites ("Linked Sites") from the Creative Connect Site. Linked Sites are not, however, reviewed, controlled, or examined by Creative Connect in any way and Creative Connect is not responsible for the content, availability, advertising, products or other materials of any such Linked Sites, or any additional links contained therein. These links do not imply Creative Connect's endorsement of or association with the Linked Sites. It is your sole responsibility to comply with the appropriate terms of service of the Linked Sites as well as with any other obligation under copyright, secrecy, defamation, decency, privacy, security and export laws related to the use of such Linked Sites and any content contained thereon. In no event shall Creative Connect be liable, directly or indirectly, to anyone for any loss or damage caused by or in connection with use of the Linked Sites or the information or material accessed-through these Linked Sites. You should direct any concerns to that site's administrator or webmaster. Creative Connect reserves the exclusive right, at its sole discretion, to add, change, decline or remove, without notice, any feature or link to any of the Linked Sites from the Site and/or to introduce different features or links to different Users. b. Permission must be granted by us for any type of link to Creative Connect. To seek our permission, you may write to Creative Connect at madeinnz@creativeconnect.co.nz. We reserve the right, however, to deny permission to link to Creative Connect or rescind any permission previously granted by us to link through any type of link, and to require termination of any such link to the Site, at our discretion at any time. Your correspondence or business dealings with, or participation in promotions of, advertisers found on or through the Service, including payment and delivery of related goods or services, and any other terms, conditions, warranties or representations associated with such dealings, are solely between you and such advertiser. You agree that Creative Connect shall not be responsible or liable for any loss or damage of any sort incurred as the result of any such dealings or as the result of the presence of such advertisers on the Service. This Site is not intended for use by children under thirteen (13) years of age, and Creative Connect does not knowingly collect personal information from children under thirteen years of age. Some of the available information may concern certain topics that may not be appropriate for children. Creative Connect may, at its discretion, require Users under 18 to obtain the consent of a parent or guardian to view certain content. You agree to abide by any such restrictions, and not to help anyone circumvent these restrictions. a. THE WEB SITE AND SERVICES ARE PROVIDED "AS IS," "WHERE IS" AND "AS AVAILABLE," WITHOUT WARRANTY OF ANY KIND, EITHER EXPRESS OR IMPLIED. WITHOUT LIMITATION OF THE FOREGOING, Creative Connect AND ITS AFFILIATES, OFFICERS, DIRECTORS, EMPLOYEES, REPRESENTATIVES, SUCCESSORS AND ASSIGNS, SPECIFICALLY DISCLAIM ANY AND ALL WARRANTIES, INCLUDING, BUT NOT LIMITED TO: (i) ANY WARRANTIES CONCERNING THE AVAILABILITY, ACCURACY, APPROPRIATENESS, RELIABILITY, TIMELINESS, USEFULNESS, OR OTHERWISE OF THE CONTENT OF THE WEB SITE OR SERVICES; AND (ii) ANY WARRANTIES OF TITLE, NON-INFRINGEMENT, MERCHANTABILITY, SECURITY, OR FITNESS FOR A PARTICULAR PURPOSE. b. THIS DISCLAIMER OF LIABILITY APPLIES TO ANY DAMAGES OR INJURY CAUSED BY THE WEB SITE, INCLUDING WITHOUT LIMITATION AS A RESULT OF (1) ANY ERROR, OMMISSION, DELETION OR DEFECT IN THE CONTENT, OR (2) ANY FAILURE OF PERFORMANCE, ERROR, OMISSION, INTERRUPTION, DELETION, DEFECT, DELAY IN OPERATION OR TRANSMISSION, COMPUTER VIRUS, COMMUNICATION LINE FAILURE, THEFT OR DESTRUCTION OR UNAUTHORIZED ACCESS TO, ALTERATION OF, OR USE OF RECORD, WHETHER FOR BREACH OF CONTRACT, TORT, NEGLIGENCE, DEFAMATION OR UNDER ANY OTHER CAUSE OF ACTION. c. Creative Connect DOES NOT WARRANT OR GUARANTEE (1) THAT ANY PORTION OF THE WEB SITE WILL BE FREE OF INFECTION BY VIRUSES, WORMS, TROJAN HORSES OR ANYTHING ELSE MANIFESTING CONTAMINATING OR DESTRUCTIVE PROPERTIES; OR (2) THAT ACCESS TO THE WEB SITE WILL BE UNINTERRUPTED OR ERROR-FREE. d. Creative Connect DOES NOT WARRANT OR MAKE ANY REPRESENTATIONS REGARDING THE USE OR THE RESULTS OF THE USE OF THE MATERIALS IN THIS WEB SITE. YOU (RATHER THAN Creative Connect OR ANY OF ITS AGENTS) ASSUME THE ENTIRE COST OF ALL NECESSARY SERVICING, REPAIR OR CORRECTION. e. APPLICABLE LAW MAY NOT ALLOW THE EXCLUSION OF IMPLIED WARRANTIES, SO THE ABOVE EXCLUSION MAY NOT APPLY TO YOU. IN NO EVENT WILL Creative Connect, ITS SPONSORS, ADVERTISERS, AFFILIATES, OFFICERS, DIRECTORS, EMPLOYEES, REPRESENTATIVES, SUCCESSORS AND ASSIGNS, BE LIABLE TO ANY PARTY (i) FOR ANY INDIRECT, SPECIAL, PUNITIVE, INCIDENTAL OR CONSEQUENTIAL DAMAGES OR ANY OTHER DAMAGES ARISING IN ANY WAY OUT OF THE AVAILABILITY, USE, RELIANCE ON, OR INABILITY TO USE THE WEB SITE, EVEN IF Creative Connect OR ITS AGENTS SHALL HAVE BEEN ADVISED OF THE POSSIBILITY OF SUCH DAMAGES, AND REGARDLESS OF THE FORM OF ACTION, WHETHER IN CONTRACT, TORT, OR OTHERWISE; OR (ii) FOR ANY CLAIM ATTRIBUTABLE TO ERRORS, OMISSIONS, OR OTHER INACCURACIES IN, OR DESTRUCTIVE PROPERTIES OF THE WEB SITE. NOTWITHSTANDING ANYTHING TO THE CONTRARY HEREIN, TO THE FULLEST EXTENT ALLOWED BY LAW, YOU AGREE TO WAIVE AND DISCHARGE ALL CLAIMS, RELEASE Creative Connect FROM ALL LIABILITY AND INDEMNIFY AND HOLD HARMLESS Creative Connect, ITS SUBSIDIARIES, AFFILIATES, PARENT COMPANY, OFFICERS, AGENTS, AND OTHER PARTNERS AND EMPLOYEES, FROM ANY AND ALL LIABILITY ON ACCOUNT OF, OR IN ANY WAY RESULTING FROM INJURIES AND DAMAGES IN ANY WAY CONNECTED WITH ANY EVENTS OR ACTIVITIES. YOU AGREE AND UNDERSTAND AND INTEND THAT THIS ASSUMPTION OF RISK AND RELEASE IS BINDING UPON YOU AND YOUR HEIRS, EXECUTORS, AGENTS, ADMINISTRATORS AND ASSIGNS, AND INCLUDES ANY MINORS ACCOMPANYING THE USER AT THE EVENTS. a. You agree to comply with all local rules and laws regarding online conduct and acceptable Content. Specifically, you agree to comply with all applicable laws regarding the transmission of technical data. b. Notwithstanding local rules or laws regarding your use of the Site, you agree that the laws of New Zealand shall govern these Terms and Conditions. You expressly agree that exclusive jurisdiction for any claim or dispute with Creative Connect or relating in any way to your use of the Site shall be in the courts located in New Zealand, and you further agree and expressly consent to the exercise of jurisdiction in such courts in connection with any such dispute, including any claim involving Creative Connect or its affiliates, officers, directors, employees, representatives, successors, assigns, or content providers. Any disputes arising under or in connection with these Terms shall be subject to the exclusive jurisdiction of the state and federal courts of New Zealand.